Engineering Electromagnetics and Waves is designed for upper-division college and university engineering students, for those who wish to learn the subject through self-study, and for practicing engineers who need an up-to-date reference text. The student using this text is assumed to have completed typical lower-division courses in physics and mathematics as well as a first course on electrical engineering circuits. 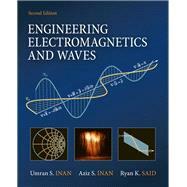 This book provides engineering students with a solid grasp of electromagnetic fundamentals and electromagnetic waves by emphasizing physical understanding and practical applications. The topical organization of the text starts with an initial exposure to transmission lines and transients on high-speed distributed circuits, naturally bridging electrical circuits and electromagnetics. UMRAN S. INAN is Professor of Electrical Engineering at Stanford University, where he serves as Director of the Space, Telecommunications, and Radioscience (STAR) Laboratory. He has received the 1998 Stanford University Tau Beta Pi Award for Excellence in Undergraduate Teaching, and actively conducts research in electromagnetic waves in plasmas, lightning discharges, ionospheric physics, and very low frequency remote sensing. Dr. Inan has served as the Ph.D. thesis advisor for 13 students and is a senior member of IEEE, a member of Tau Beta Pi, Sigma Xi, the American Geophysical Union, the Electromagnetics Academy, and serves as Secretary of U.S. National Committee of the International Union of Radio Science (URSI). AZIZ S. INAN is Associate Professor of Electrical Engineering at the University of Portland, where he has also served as Department Chairman. A winner of the University's faculty teaching award, he conducts research in electromagnetic wave propagation in conducting and inhomogeneous media. He is a member of Tau Beta Pi and IEEE.